David is the the owner of the England’s North East website. He is a writer, journalist, and historian with solid roots in the North East of England. He has worked as a newspaper columnist, a researcher and as the editor of several magazines. David is the author of around 50 books covering history with a special interest in the North East. The England’s North East site began life in the mid 1990s as a history website, described by former Guardian Deputy Editor, David Mckie as “entertaining and erudite”. The website has now been partially redeveloped as a regional portal and hub promoting all aspects of the region’s business and culture but still maintains the original history pages within the site though now more comprehensive and constantly expanding. Over the years David has regularly contributed to broadcasts. His TV appearances include Ant and Dec’s History of Tyneside (ITV), The Face of Britain (Channel 4 with Neil Oliver), The One Show (BBC1 with Phil Tuffnel), Northern Eye (ITV), Inside Out (ITV with Helen Skelton), North East Tonight (ITV with Mike Neville), Wayward Women (ITV), How they Built Britain (History Channel with Adam Hart Davis), Martina Cole’s Lady Killers (ITV), Sky Sports Sunday (in prelude to a Sunderland v Newcastle match) and Countrywise (BBC1 with Bettany Hughes). He has featured in many radio broadcasts including appearances on BBC Radio 4 as well as Five Live, Canada’s Radio 1, Australian radio, BBC Tees and BBC Radio Newcastle. Over the years David has been a regular public speaker at a wide variety of organisations and venues including book launches, literary festivals, schools, colleges and professional societies. His speaking style is described as lively, engaging, informative, humorous and entertaining. David likes to spend his spare time cycling in the local countryside or enjoying time with his daughter. His interests include photography, eating out, travel, exploring the countryside, wandering through historic townscapes and researching history. He has a particular fascination and curiosity for the region’s dialect and place-names. David enjoys all forms of communication in a professional environment and is passionate about the economic development of the region as well as its heritage. David’s publications include The Millennium History of North East England (1999) hailed by the then Prime Minister. In his twenties David owned his own publishing business which he set up with the backing of the Prince’s Youth Business Trust and he personally presented some of his early publications to the Prince of Wales. Born in Durham, as a child David lived in the railway station house at Chester-le-Street and once worked at the railway station at Beamish Open Air Museum. As a youngster he lived for a time in the south of the region near Stockton-on-Tees which enabled him see the region from a slightly different geographical angle. Educated at Northumbria University (or Newcastle Polytechnic as it then was) David worked at the Gateshead National Garden Festival in 1990 where he gave tours to visitors including foreign ministers, company directors, school children from Chernobyl, local mayors and other dignitaries. For a time in the late 1980s David played as a drummer (not a particularly good one it should be said) in a North East punk-folk-rock band called The Whisky Priests. He has performed as an actor with Durham City Theatre and with the Durham Shakespeare Group in a host of different roles. With an interest in tourism, David has hosted and performed humorous guided tours for a national hotel conference with actors portraying characters from history and has assisted a tourism business that gave North American visitors tours of the region. For more than a decade David worked for The Northern Echo newspaper as a columnist and as the editor of a number of magazine publications published by the newspaper. For a time David worked for a Durham-based marketing team as a magazine editor for people with disabilities, launching and managing the publication project from scratch through a consultative process and receiving national accolades. David has worked at the forefront of a number of publishing projects including research for a Heritage Lottery Fund bid and for book writing projects that include a project suggested and backed by the children’s author Terry Deary and another book project instigated by the former Sunderland AFC chairman Niall Quinn, as well as work for the former One North East chairman, Paul Callaghan. 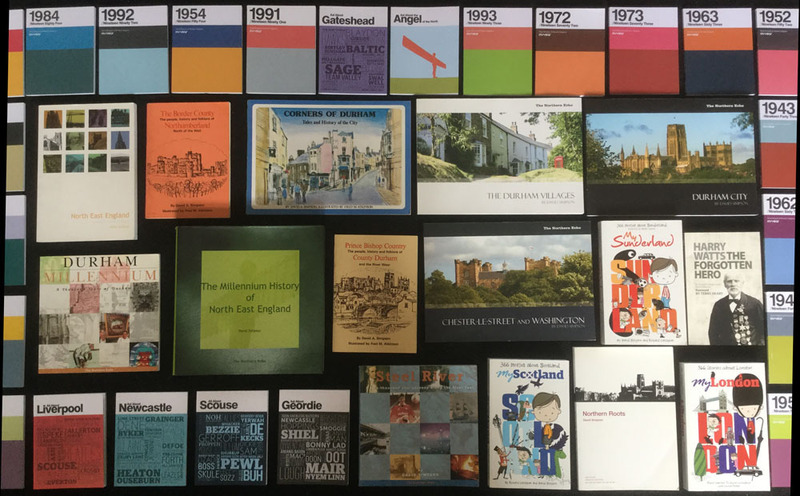 In addition to his publications covering North East England, David has authored and co-authored books covering London, Scotland and Liverpool as well as contributing to titles on popular culture and current affairs from particular years in history. David can be contacted through the England’s North East social media pages on Facebook and Twitter or through the England’s North East contact page.